Pasola derived from the word "sola" or "hola", which means a type of wood that, used for javelin that throwing from the top of a horse and it being driven fast by the two opposing groups. After obtaining a suffix `pa '(pa-sola, pa-hola), it means to be a game. So Pasola or pahola can be referring to an arcade game from the wooden javelin throwing on horseback that were driven tight between the two opposing groups. During the ceremony, it ends up in a bloody game when the wooden spear hit the bare flesh of the participant. The Sumbanese believe that the spilled blood will fertilize the land and the paddy field. Pasola is part of traditional ceremony series, performed by the Sumba who still adhered to the original religion called Marapu. 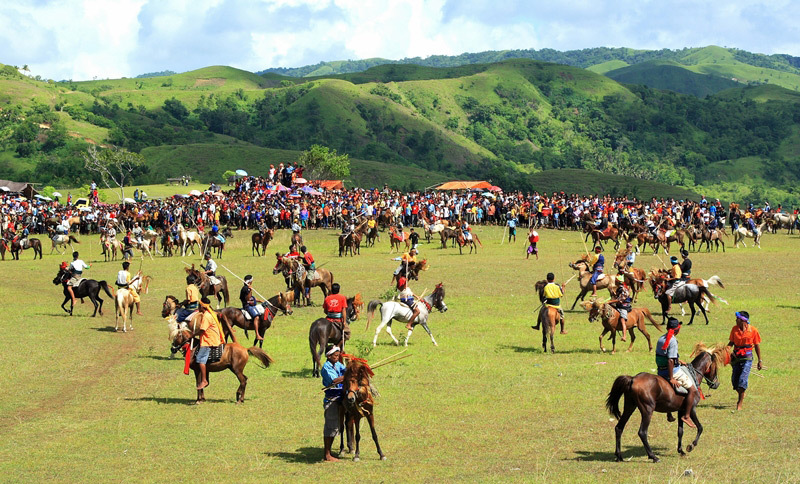 Pasola game is held in four villages in the West Sumba district. Those fourth villages among others are Kodi, Lamboya, Wonokaka, and Gaura. Pasola implementation in the four villages is done in turns, between February and March each year. According to the folklore of Sumba that evolving from generations, the Pasola tradition begun from the story of a beautiful widow named Rabu Kaba in Kampung Waiwuang who has a husband named Umbu Dulla, one of the leaders in the village Waiwuang. Umbu Dulla who went for hunting found out that the wife had cheated on him and he held the Pasola tradition to forget his sorrow for losing his wife. Pasola ceremony always begins with series of nyale traditional procession as a form of gratitude for God's gift of abundant harvest. Nyale, in local language means sea worms that appearing in large quantities by the beach. The emerging of Nyale is a symbol of prosperity for the people of Sumba and its surroundings. Catching Nyale ceremony will be held on the evening of the full moon and it led by the Para Rato, traditional leader of Sumba. The tradition of Pasola is implemented in a wide field as a "battlefield" and it attended by all residents and tourists, both local and international. Every group that involved in pasola is consists of 100 youngster that armed with sola or spears that made of a blunt end wood, with diameter of approximately 1.5 cm. Both the participants of the game will facing and attacked to each other like a real battle between two groups of knights Sumba.